You can't always predict what will be a hit from a collection. 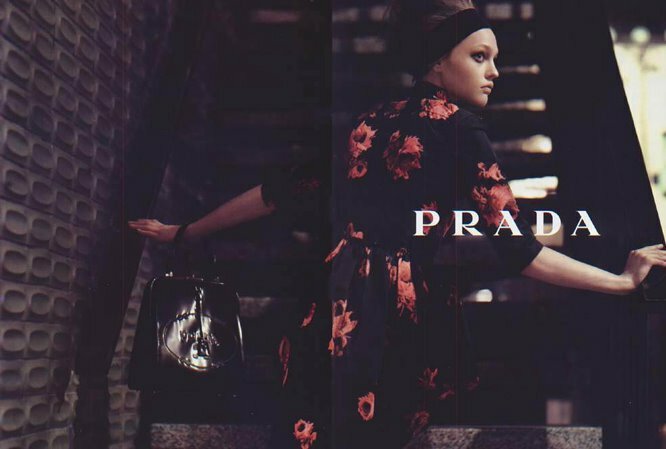 When I first saw the fall/05 Prada ad with Sasha Pivovarova in a rose print dress, it didn't really jump out at me. Likewise on the runways. Possibly, this is because the dress was paired with a headband, granny shoes, and cadavar makeup... However, I've been seeing this red rose print dress on celebrities everywhere, from premieres to magazine spreads to dinners out. It is available with blue or red roses- the latter seeming to be the favourite- and now that I've seen it being worn with casually upswept hair and simple, classic shoes, I really like it. Posted by la femme at 10:08 p.m. Even Anna Wintour wore it!